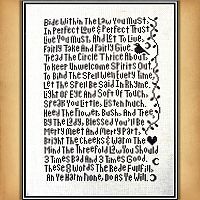 - Framed along the right side by a leafy vine with crescent moons and a bird, the text reads: "Bide within the law you must, in perfect love and perfect trust. Live you must, and let to live, fairly take and fairly give. Tread the circle thrice about, to keep unwelcome spirits out. 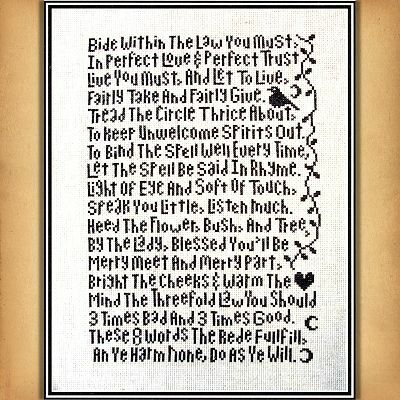 To bind the spell well every time, let the spell be said in rhyme. Light of eye and soft of touch, speak you little, listen much. Heed the flower, bush, and tree, by the lady, blessed you'll be. Merry meet and merry part, bright the cheeks and warm the heart. Mind the threefold law you should, 3 times bad and 3 times good. These 8 words the rede fulfill, an ye harm none, do as ye will." 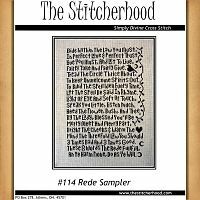 This design measures 160 stitches high by 108 stitches wide. 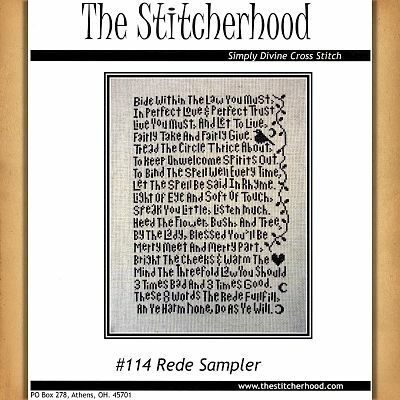 Do you have any other questions about our Rede Sampler Cross Stitch Pattern?